Nature is constantly evolving—its limits determined only by variations that threaten the viability of species. Research into the origin and expansion of the genetic code* are fundamental to explain the evolution of life. In Science Advances, a team of biologists specialised in this field explain a limitation that put the brakes on the further development of the genetic code, which is the universal set of rules that all organisms on Earth use to translate genetic sequences of nucleic acids (DNA and RNA) into the amino acid sequences that comprise the proteins that undertake cell functions. One of the goals of synthetic biology is to increase the genetic code and to modify it to build proteins with different amino acids in order to achieve novel functions. For this purpose, researchers use organisms such as bacteria in highly controlled conditions to make proteins of given characteristics. “But this is really difficult to do and our work demonstrates that the conflict of identify between synthetic tRNAs designed in the lab and existing tRNAs has to be avoided if we are to achieve more effective biotechnological systems,” concludes the researcher. 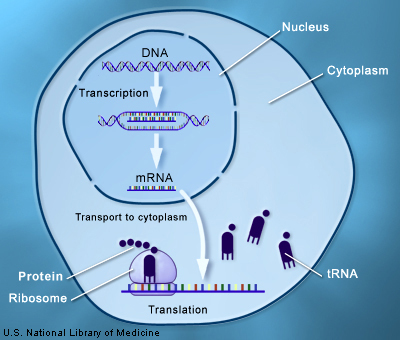 Genetic information is stored in the cell nucleus in the form of DNA. Genes hold the information to produce proteins, which are the molecules that carry out most functions in a cell and therefore in an organism. But proteins are produced outside the nucleus, in the cytoplasm. Furthermore, genes and proteins use different languages. That used by the former is based on the letters of DNA—the 4 base types known as Adenine (A), Thymine (T), Cytosine (C) and Guanine (G). In contrast, the latter use amino acids—20 distinct molecules, which, when combined, comprise a wide variety of proteins. The genetic code is the dictionary that that nature “invented” to be able to translate from one language to another. Genes are very long sequences formed by DNA bases (ATGCTTTTCACC...). The code reads these in sets of three, which are called triplets or codons (ATG,CTT,TTC,ACC,...). Each codon corresponds to an amino acid. For example, the codon ATG codes for the amino acid methionine and GCT for alanine. First, the genes are copied into a messenger RNA (mRNA), a nucleic acid with a simpler structure than that of DNA. This messenger molecule moves to the cytoplasm, where it can translate the information. The key molecules involved in this process are the ribosome, which is the protein “factory”, and transfer RNA (tRNA). 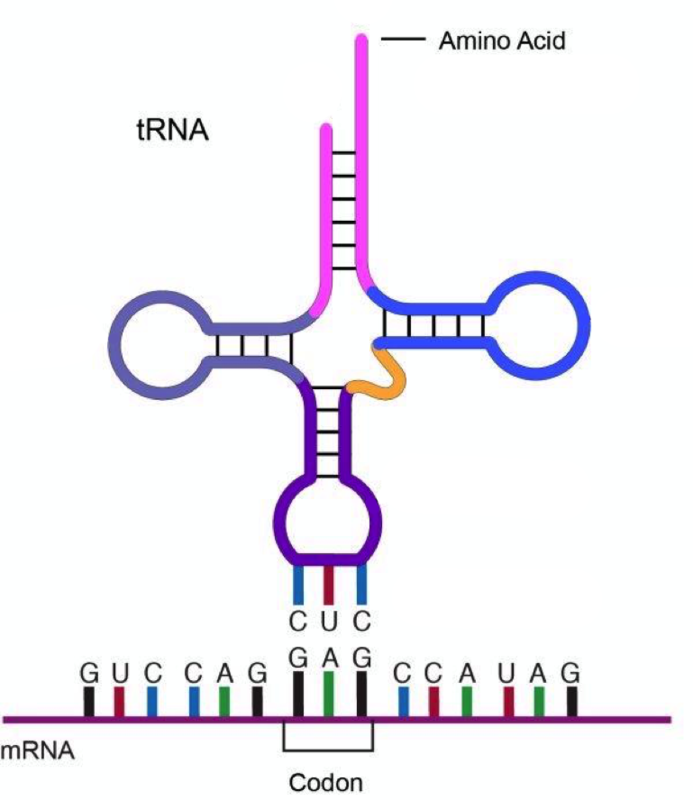 tRNA is the physical representation of the genetic code and it speaks the languages of both DNA and proteins. In this regard, these crucial molecules have a codon recognition sequence at one end, e.g. GCT, while at the other end they have the amino acid corresponding to the codon, i.e. alanine. As the ribosome reads the mRNA, the amino acids of tRNAs start building chains to form the protein encoded by the gene.